This e-Government Customer Perception Surveys were conducted in February / March 2008 and March 2009 for the reporting periods of FY20071and FY2008 respectively. To determine the proportion of users who transacted with the Government electronically, either on their own or with help. To determine the level of satisfaction in using Government electronic services. Research Methodology 1,200 respondents, representative of the total demographic population above the age of 15, were surveyed. Data collection was done through telephone interviews. Respondents who transacted with the Government continued to do so mostly via electronic means, with an increase observed for those who use the Internet. 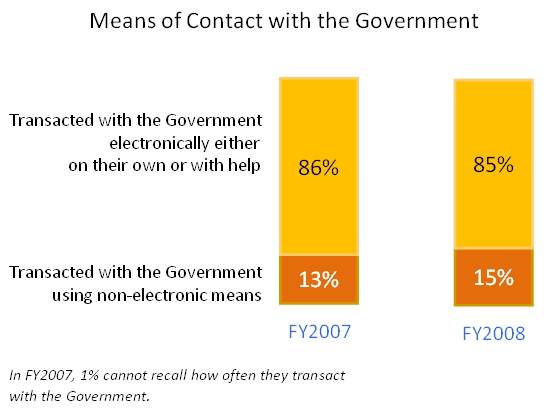 More than 8 out of 10 (85% in FY2008, 86% in FY2007) who transacted with Government did so electronically (via the Internet, automated kiosks, email, telephone via the Interactive Voice Recognition System, SMS, etc. ), either on their own or with help, at least once in the past 12 months of the Financial Year. The typical profile of such users, whether on their own or with help, was skewed towards young adults (aged 20 to 39 years old) and white collar workers. The remaining group who had never transacted electronically with the Government was primarily senior citizens, blue-collar workers and the non-working group. To help this group of users, the Government has put in place a network of easily accessible CitizenConnect centres. They can go to any CitizenConnect centre for free internet access or complimentary help to transact electronically with the Government. There are currently 27 Citizen Connect centres located throughout Singapore. Satisfaction levels have risen to 54% in FY2008, up from 49% in FY2007, where respondents gave a rating of 5 and above on a 6-point scale. Users were happy with the quality of Government electronic services. 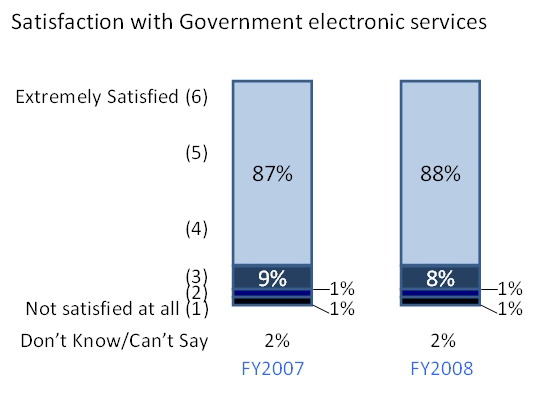 9 in 10 (in FY2008 and FY2007) would recommend Government electronic services to others. If “don’t know/ can’t say” is excluded, percent satisfied (i.e. 4-6) is 89% for FY2007 and 90% for FY2008. User friendly 1Note: FY2007 refers to the period from 1 April 2007 to 31 March 2008. FY2008 refers to the period from 1 April 2008 to 31 March 2009.